With a reputation as the hottest festival on theunderground music calendar, techno adventure Sonus Festival is proud to unveilthe final tier of international heavyweight live acts and selectors from thisyears champion lineup. Latest additions for 2015 include Alexandra, Archie Hamilton, Bella Sarris,Guy Gerber, Homeboy (live) Margaret Dygas, Martin Buttrich (live) Miss Soulfly,Woo York (live) plus many morehot-property underground forces ready to grace therevered arenas. Renowned for monumental, ambitious programming thatunites only the highest calibre of artists in one place, Sonus Festival is the go-to party for club kids across the world. Set to sell-out for the third yearrunning, this years soiree will see 10,000 revellers from across the planetjoin universal forces over five days and five nights between 16th-20th August in the idyllic, hedonistic home that is Zcre Beach. Long-established legends, acclaimed tastemakers,rising stars and fresh Croatian talents make up a nearly eighty strong lineupthat is no doubt the strongest effort to date. New additions include Alexandra with effortlessly cool minimalism, and London boy Archie Hamilton with his hypnotic blend of house and tech. Bringingthe feel-good vibes are Germany’s Disco Channel, and Fabio Florido steps up as one of the hottest talents to recentlyemerge out of Italy, his debut EP „Be you“ released on Minus last summer.Progressive pioneer Guy Gerber also plays apart in proceedings. Repping for the female contingent is Margaret Dygas, with dubbed-out techno flavours that will keepravers mesmerised for hours. Also on hand is first lady of ENTER, the sensual Bella Sarris and Croatian scene mainstay Marina Karamarko. Mixing things up with their immersive live sets isfast-rising Kiev duo Woo York of Soma Records, synth-laden disco driven Homeboy, plus the legendary Desolot co-founder, Martin Buttrich. 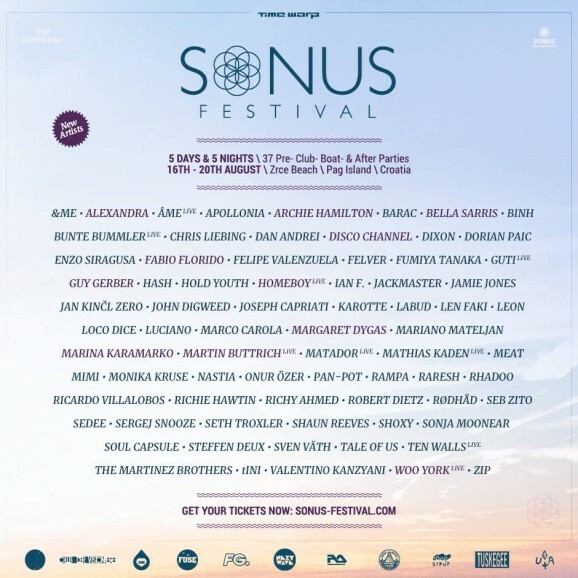 On top of these new additions, Sonus Festival’s original lineup boasts only the most crucial names from the undergroundhierarchy, including &ME, Apollonia,Enzo Siragusa, Guti, Jackmaster, Jamie Jones, Joseph Capriati, Marco Corola,Monika Kruse, Nastia, Ricardo Villalobos, Rødhåd, Richie Hawtin, Seth Troxler, SvenVäth, Ten Walls, tINI, Valentino Kanzyani, Zip and many, many more. 79 acts deep, Zcre Beach soutdoor stages, arenas and boat partieswill be awash with deep electronic grooves, big techno bangers, kaleidoscopic drumkicks and funk-infused disco for an all-out party in the tropical heat. Idyllic Pag Island destination Zcre Beach acts as thesetting for this annual outing; with the perfect combination of golden beaches,on-site clubs and beautiful waves fully fit for Sonus Festival’s prolific boatparties. Easily accessible from Zadar, Split and Zagreb airports, this stunningbeach spot is one of the easiest of the Croatian destinations to reach. Nowthree years strong, Sonus Festival is curated by Cosmopop as well as the Sonuscrew, the team behind Time Warp events, and is now a serious contender for the biggest success in Croatia’s starstudded festival crown. Each year has delivered a five day and five night purist house and techno outing with only thefinest world-class artists invited to play.